If you are club member with the BC Discover Award and want to achieve greater independence or specific ambitions by becoming more proficient then you can come along to the Improver sessions or progress beyond that with the discipline specific BC Personal Performance Awards. Note that there is an additional fee for the Explore certificate (�8) payable to British Canoeing. Canoe Improvers (as existing or new club members) can continue with their progression on Tuesday/Friday evening sessions following on from the Intro to Paddlesports course (or just come along for a paddle if you are content at your level). The Explore Award is the baseline for independent paddling skills for attending most club trips and transitioning to paddle on Wednesday club nights. The Open Canoe Weekend in July offers a two-day varied programme of skill development, scenic paddles along the Jurassic coast - and of course, a chance to meet and renew friendships. 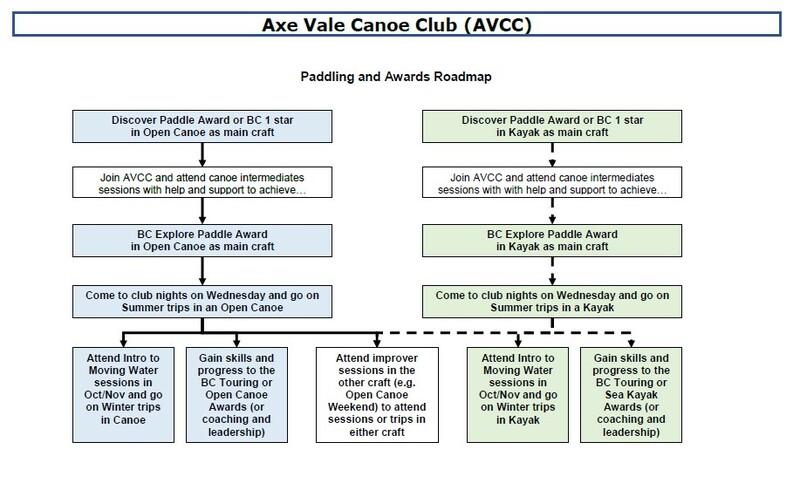 Guidance on the skills needed to achieve the BC Explore Award is provided as part of the Tuesday or Friday evening sessions following on from the Intro to Paddlesports course. So come along on those evenings at 6:30pm and have some fun whilst learning the extra strokes and rescues (Draw, Support and X-Rescues - see Paddle Stokes) - or just go for a paddle (if you are content at that level).